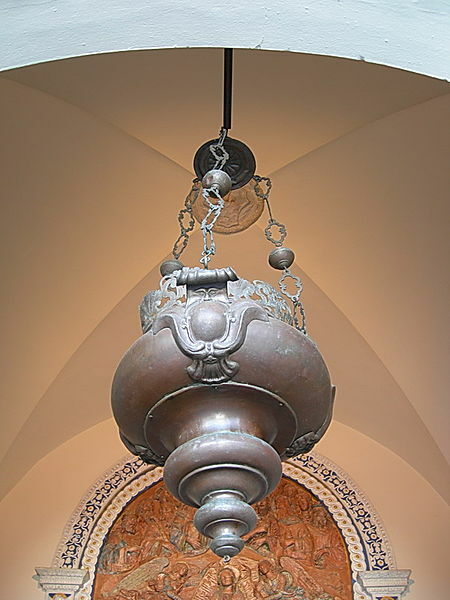 According to the tradition, Galileo Galilei discovered the law of the pendulum oscillations by observing those of the incense lamp that in his time was suspended in the center of the aisle of the cathedral of Pisa, and that we see in the image here on the side. To measure the period of oscillations of this pendulum, Galileo used the most accurate clock available at his time: its own heartbeat. Certainly, the heartbeat can be a good reference to assess periodic regularity such as pendulum oscillations, but today we know that the heart rate clock is far from accurate. In fact, it is even more inaccurate the more one is in good health. Before tackling what really is the heart of this article, pun intended, let’s spend a few words to get a general idea of ​​how our biological pump works. First of all, a small philological note. 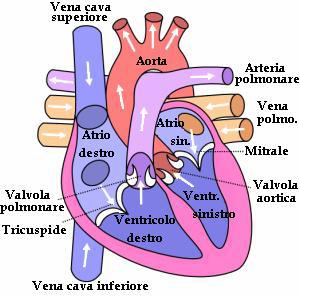 The heart, from a functional point of view, is a so-called peristaltic pump, from the Greek verb “περιστέλλω peri-stello” which means “compress”, which is in turn formed by “peri” which means “around” and “stello” “to place, to dispose”. These type of pumps act on the fluid they have to compress through the contraction of the walls surrounding it. The two phases of the contraction of the heart are called “systole = contraction” derived from συστέλλω sy-stello, formed by syn=together and stello=to place, and “diastole=dilation” derived from διαστέλλω dia-stello, formed by dia=division stello=to place. As we know, the heart is a double pump, as one half, the left-side one, is pushing the blood through the large circulation that involves our whole body, and the other half, the right-side one, pushes it into the small circulation, which only affects the lungs, where oxygen and carbon dioxide are exchanged. Each half is in turn divided into two parts, the upper one, called the atrium, which collects the blood from the large or small circulation and pushes it towards the lower part, called the ventricle, which is to push the blood to the periphery or towards the lungs. The correct operation of the circuit is also ensured by the presence of 4 valves which prevent the blood from flowing in any direction, but actually to follow the path described above. From a physiological point of view, the heart is a hollow muscle, roughly the size of a punch. In the image here to the side you can see a schematic, where are indicated the cavities we have mentioned and the valves that regulate the flow. Immediately at the beginning of the aorta, the artery that conveys all the blood destined to the periphery, the so-called coronary arteries depart, which are supposed to irrigate the heart muscle, thus providing a portion of the blood as clean and oxygenated as possible. At every contraction of this muscle, blood is set in motion and forced to go through the innumerable ramifications of our circulatory system. On average a healthy heart makes 100,000 beats per day and pumps 8,000 liters of blood. But who tells the heart how and when to contract? Nobody! As the title of this paragraph says, the heart is self-sufficient in its operation. This is possible thanks to the fact that it is equipped with a so-called conduction system. The conduction system is highlighted in yellow in the image to the side. This is a sort of electrical circuit, made up of specialized cells, capable of generating electrochemical impulses that stimulate the contraction of the muscle cells of the heart without the intervention of the central nervous system or the spinal cord, as is the case with other skeletal muscles. The impulse leading to the contraction of the heart starts from the sinoatrial node and causes the contractions of the adjacent area, then of the atriums. The sinoatrial node produces a pulse with a frequency of about 1Hz, that is a beats per second, and represents the true natural pacemaker of the heart. The rhythm that it imposes on the heart muscle is called sinus rhythm. The pulse continues its journey to the atrioventricular node where it is slowed down and continues its journey along the conduction circuit to be distributed across the periphery of the ventricles, causing their consequent contraction. The fact that blood is pushed in the right direction and with the right force is closely dependent on the order in which the various parts of the heart contract. For this reason, the rate at which impulses propagate in the heart muscle is very important. Without the delay introduced by the atrioventricular node, atria and ventricles would contract at the same time preventing the blood from flowing to each other. To coordinate the contraction of the various parts of the heart, the paths that transmit the signal use different mechanisms. Nodal tissue has an action potential that arises spontaneously, it’s slow and it’s related to the Calcium ion (Ca++) concentration. Conductive and contractile tissue has a rapid response and it’s related to Sodium ions (Na+). The contractile tissue also has a phase called plateau, in which the action potential remains high and lengthens the refractory period in which the cells are unable to receive a new excitement. This prevents the rise of tetanic contractions, with fibers that remain contracted when they are subjected to stimuli too close to each other. 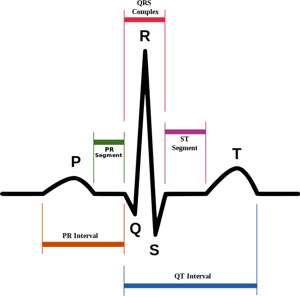 In this diagram we can see the portion of an electrocardiogram representing a period of sinus rhythm. We can locate the P wave, which represents the pulse that starts from the sinoatrial node, and the R wave, representing the pulse that starts from the atrioventricular node. The frequency with which impulses are performed is, as said, naturally set to about one hertz from the sinus node, but is normally modulated by the influence of the sympathetic nerve, which has excitatory function, and the antagonistic influence of the vague nerve, which tends to relax the heart rhythm. The sound we hear when trying to listen to someone’s heart is fact that of the R wave that causes the ventricular fiber contraction. The T wave instead represents the time when the ventricular fibers reactivate to prepare for a new cycle.